Mormon Wookiee: #122: My Name Used to Be Muhammad. #122: My Name Used to Be Muhammad. On Friday afternoon, I stumbled upon an LDS Living article about Tito Momen, a former Muslim who had since converted to Mormonism. Tito's story is one of the most amazing things I have ever read. 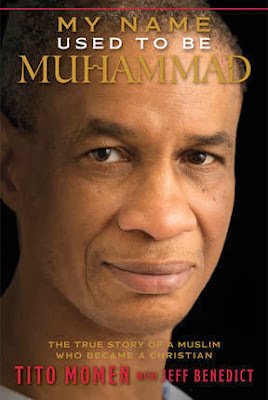 After finishing the article, I immediately downloaded the full book "My Name Used to Be Muhammad" (available on Amazon or at Deseret Book) written by Tito and co-author Jeff Benedict. I couldn't put it down. I finished it just moments ago, and the book has changed my life. In many ways, Tito's story is terribly tragic. He is disowned by his family, he loses the love of his life, he is repeatedly beaten and mocked, and he suffers fifteen years in prison for his beliefs before finally being released in 2006 for medical reasons--particularly diabetes, stroke, and heart problems. But at the same time, Tito's story is one of glorious redemption. Through all of his trials, Tito finds the gospel of Jesus Christ, which is a greater gift than all of the wealth in the world. Tito's experiences bring to my mind the words of the Lord to Joseph Smith while in Liberty Jail: "My son, peace be unto thy soul; thine adversity and thine afflictions shall be but a small moment; And then, if thou endure it well, God shall exalt thee on high; thou shalt triumph over all thy foes" (D&C 121:7-8). Tito's life is a reminder to me that no matter how dark life may seem to be, Christ will never forsake us. He will ALWAYS be there. One note: In the book, Tito does not mince words in his descriptions of abuse, drug and alcohol use, sexuality, and harsh prison life. Some of his descriptions are graphic and are obviously not meant for children. However, for adults of all Christian faiths, I offer my highest recommendation for "My Name Used to Be Muhammad". Download it. Read it. And change your life because of it. You won't regret it. Hinkle received an order from Judge Elias Higbee to order out the militia of Caldwell County. Joseph Smith reduced Hinkle’s command and took charge of the forces. George Hinkle recalled: I have heard Jos[eph] Smith Jr say that he believed Mahommet [Muhammad] was a good man, that the Koran [Qur’an] was not a true thing [due to it was collected after his death and 4:157, 4:171, 5:75, 43:63-64, 112 All], but the world believed Mahommet [Muhammad] as they beli[e]ved him. & that he believed Mahommet [Muhammad] a true prophet (42; 1841, 128). Secondly Tito Momen experiment with music and alcohol, searched for purpose, did other things forbidden in their youth as many college students do! Thirdly He was lawfully Jailed for his fake passport and illegal theological preaching. Fourthly the LDS Faith is more close in belief to Hinduism and or Taoism. Joseph Smith taught eight different concepts of belief in God. Fifthly the so called Curse of Cain taught in the Journal of Discourses of Brigham Young was never to be lifted and still has not been even though the priesthood was given to the Negros [Africans, Aborigines of Australia and their dependents] by Spencer W. Kimble but there was Elder Elijah Able 3/3/1836 CE and made a Seventy 4/4/1841 CE, his descendants in Logan, Utah USA and else where and a few others that had the Priesthood all threw their membership in the LDS Church! Like Elder Lewis a barber ordained by William Smith in Batavia, New York, USA, recorded in a letter in the Journal History, June 2, 1847 CE. Lastly the 613 Laws of the Torah are still valid Jesus (PBH) never abolished them but Confirmed them and Jesus (PBH) came only to the Lost Sheep of Israel as it says in St. Matthew! Jesus (PBH) Quotes Moses (PBH) from Deu. 6:4 Hear, O Israel: The Lord our God is one Lord. And this is echoed in Surah Al-Ikhlaas or At-Tauhid (The Purity) the 112th Chapter of the Qur'an 1. Say (O Muhammad ()): "He is Allah, (the) One. 2. "Allah-us-Samad (The Self-Sufficient Master, Whom all creatures need, He neither eats nor drinks). 3. "He begets not, nor was He begotten; 4. "And there is none co-equal or comparable unto Him." Not that we can be come Gods or a God or God had any children. We are Creations not Children of God! As Jesus (PBH) said The Truth shall set you Free! When you are shooting for a move or anything you must have patience and what else is the good team. But also you must be good in managing your team. #121: Real World Heroes: Ian and Larissa Murphy.